Deborah Warner's beautiful and evocative production of Britten's final operatic masterpiece has been acclaimed as an 'exquisitely achieved marriage of music, drama and design' (The Independent). 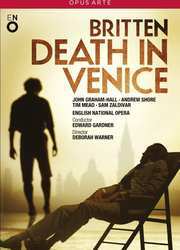 In Britten's luminous and compelling interpretation of Thomas Mann's classic novella, the ageing writer Gustav von Aschenbach's infatuation with the Polish boy Tadzio and his subsequent decline are portrayed in a 'remarkable and harrowingly believeable' performance (The Guardian) by John Graham-Hall, who had already won golden opinions for singing the role of Aschenbach at La Scala. The superb ENO chorus and orchestra are conducted by Edward Gardner, a long-standing champion of Britten's music.